Otown’s music authority Shows I Go To will be featuring their first ever epic line up at the Florida Music Festival, rocking The Social on Friday, May 11th with an eclectic array of talent. Glowing Nowhere are psychedelic something or other and had their debut at Will’s the other month to great acclaim. If you favor The Oh Sees, pedals, and riffs that go on for days, you’re in for a treat. Cool Grandma are cool punks just trying to shake things up a bit. The outfit features the certified skins slapping, beat keeping, and all around badassery of Vanessa Brewster who plays in Orlando’s own Wet Nurse. Anjelica Becton is a solo artist from Melbourne, FL who can make a room go quiet and in an instant, have everyone singing back a sublime Buddy Holly cover. Her lyrics are soft, candid, and cutting all under 2 minutes and 20 seconds. 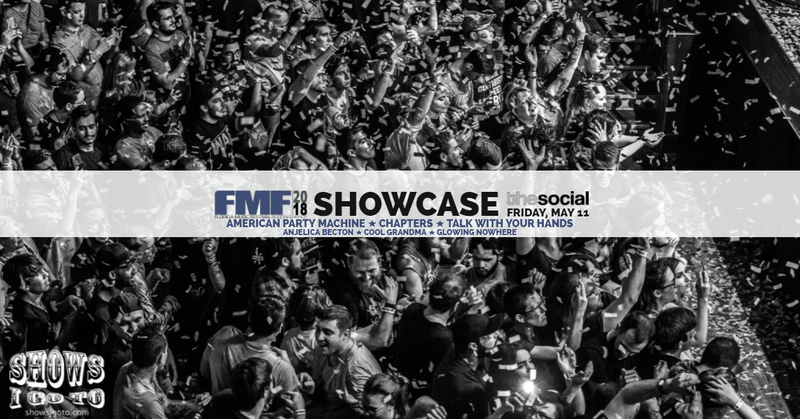 Talk With Your Hands are the party; a true indie rock groove dream They’re the soundtrack you’re playing when you leave work early on Friday to get ready for a weekend of dancing with friends. Chapters are Orlando’s best new band. It’s hard to wrap your head around Dylan’s fret work or Kyle’s intense tempo change behind the kit, but, you’ve been warned, Math Rock is about to become your newest obsession. American Party Machine is the most Amazin’, Blunt Blazin’, Purple Hazin’, And Hell Raisin’ Rock n Roll Band that has ever or will ever exist. WOOOOO!!!! APM is a wrestling fanatics crossover dream; Southern party rock and good ol fashioned body slamming.